Sound in Windows Vista and 7 is quite a bit more complicated than it needs to be, so troubleshooting sound problems is a real chore. The best way to fix a PC that won’t play sound is with a systematic approach. Also, make sure to read my previous post on recovering a missing volume icon in the system tray. Start with the obvious. If you’re using external speakers, make sure they’re plugged in, turned on, and turned up. Try plugging the speakers into an iPod, home stereo, or other audio source to make sure they’re actually working. Using a laptop with integrated speakers? Most laptops have their own independent volume controls, and some are unlucky enough to have two or three. The first type is the old-school walkman-esque dial, usually found right next to the headphone/speaker jack (sometimes these dials only control external audio, but not always). The second type is usually found on the keyboard, accessed by holding the Fn key while pressing another key decorated with a speaker icon. The third type is found on newer laptops, in the group of media quick-access buttons. Make your best effort to turn all these controls up. 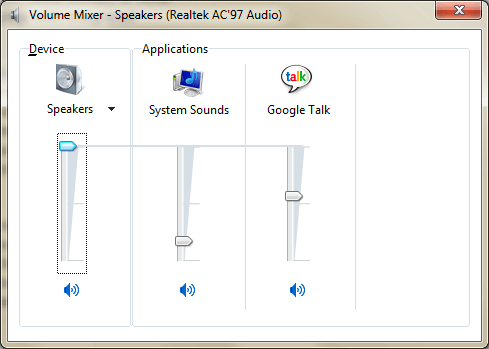 If hardware volume controls are a dead end, open the Vista’s Volume Mixer (sndvol.exe), and then open the Device menu. If there’s more than one device listed, make sure the one you want to use has a checkmark next to it. Turn up the Device volume control as high as it will go. Also check the subordinate volume controls to the right, one for each open sound-enabled application and one for Windows itself, and make sure they’re all turned up. Make sure it is the default device in the Playback tab. If you do not see the device name of your hardware then you will need to install the compatible driver of your sound card. Visit the soundcard’s manufacturer website to download the updated drivers – make sure to download and install the compatible driver as there are separate installers for XP, Vista and Windows 7. 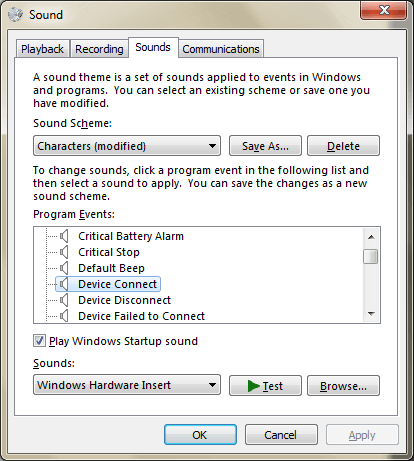 You can also use the Sounds tab to test and play the different sounds used by Windows. 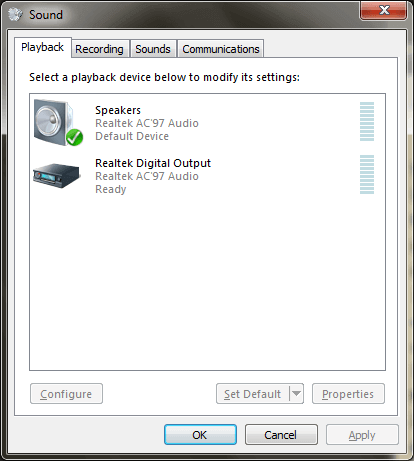 The steps above pretty much covered on how to make an audio device work in Windows. I have encountered old devices that are not compatible with Vista because the manufacturers did not write updated drivers for them so do not be surprised by this sad reality. You might need to upgrade to a newer soundcard if this is the case. Ben Carigtan shows you how it’s done! Unable to Pin Programs to Taskbar in Windows 7?